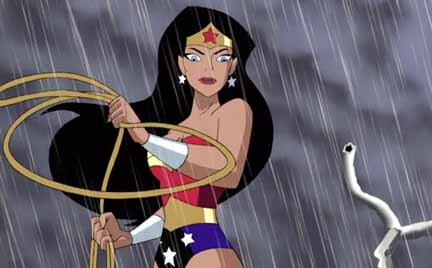 Cartoon Network has pushed up the premiere of Justice League Unlimited a week. The first episode of the revamped series, "Initiation," will air on Saturday, July 31, at 8:30 p.m. (ET). Look for the "Starcrossed" movie to repeat on Saturday, July 24 at 7:30 p.m. (ET). Cartoon Network will also start airing new episodes of Teen Titans on Saturday, July 31 at 8 p.m. The episode airing that night is "Betrayal." Look for more Justice League and Teen Titans news soon here in The Continuum. For a covers and four-page previews of Marvel Comics titles arriving in stores on Wednesday, CLICK HERE. Titles include Amazing Fantasy #2, Avengers/Thunderbolts #5, Iron Fist #4, Iron Man #85, Powerless #1, Spectacular Spider-Man #16, Spider-Man/Doctor Octopus: Year One #2, Wolverine/Punisher #4 and X-Statix #24. Spider-Man 2 producer Laura Ziskin said the filmmakers "weren't out to reinvent the wheel" with the sequel. "The audience loves these characters and is eager to learn where they're going next," Ziskin said. "So, for each character in Spider-Man 2 there is an evolution, and along the way, suspense about what will happen to them. The obstacles they are facing have a feeling of inevitability." The emphasis on character has been on the major points hit upon in positive reveiws for the film. Ziskin said that is greatly due to director Sam Raimi. "One of the really striking aspects about Sam is that he is the audience for this film," Ziskin said. "He makes the movie for the audience, identifies with the characters and is always aware of the rhythms and how each sequence will play -- both to him and the other members of the audience. That makes him the perfect director for this kind of material. Ziskin said that the new character in the sequel, Alfred Molina's Doc Ock, continues the character-driven elements of the franchise. "Alfred has an immense talent, and he brings a wealth of experience and humanity to this role," Ziskin said. "He perfectly captures the character's duality. Otto Octavius is a man who has dreams, desires and flaws. When he gets carried away in the service of something he feels is vital to the betterment of mankind, his hubris brings him down. Doc Ock is not as much an alter ego as the darker side of Otto Ocatvius emerging. That makes for a very credible -- and terrifying -- villain." Look for more on Spider-Man 2 on Friday here in The Continuum. Horrorcide, a selection of horror short stories written by Steve Niles, will be released by IDW Publishing in September. Josh Medors, Ben Templesmith and Chee each provide 16 pages of art for the book. "I love short horror stories," Niles said. "It gives me a chance to play with an assortment of ideas and work with my favorite people in the world. I'm very excited about this one. Hell, Josh's cover alone is worth the price!?" "Steve Niles has proven that his imagination is nearly boundless -- that even though he writes a lot of books, he still has more stories to tell," said Jeff Mariotte, IDW's Editor-in-Chief. "Horrorcide lets him tell a few of those tales -- but if we gave him the space he could probably keep going for another thousand pages, and still not hit bottom." Horrorcide will be 48 pages and cost $6.99. Jessica Alba, who is starring in the Sin City movie, will appear on MTV's Total Request Live on Monday. Coming Friday: Spider-Man news -- and much more!! !